Philippine President Rodrigo Duterte, left, with his aide, Christopher “Bong” Go, who is a senatorial candidate in next month’s midterm elections, in Manila, Philippines, Oct. 15, 2018 (AP photo by Aaron Favila). 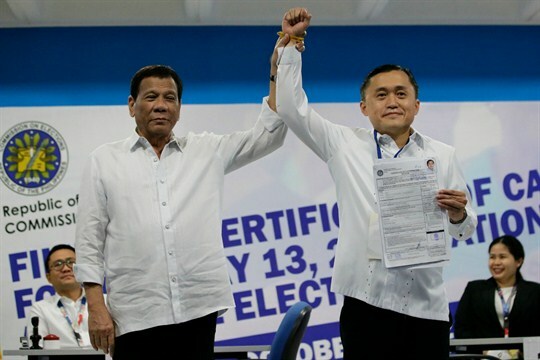 The Philippines is set to hold congressional, provincial and local elections on May 13, midway through President Rodrigo Duterte’s six-year term. The polls are widely seen as a referendum on the controversial but still-popular Duterte, who has drawn international condemnation for his repressive tactics and his brutal war on drugs. The key battleground in next month’s elections is the 24-seat Senate, where Duterte-backed candidates are poised to win a majority of the 12 seats up for grabs. In an interview with WPR, Malcolm Cook, a senior fellow at the ISEAS-Yusof Ishak Institute in Singapore, discusses the outlook for the elections, the beleaguered state of the country’s opposition and the long-term impacts of Duterte’s presidency.